Don’t let this happen to your tapes! The above image is an extreme example of a binder problem with 1/4 inch tape leading to delamination where the oxide is literally peeling away from the tape. Once this has happened there’s no going back. so much of the binder had peeled away that the tape while finally playable had very obvious dropouts affecting both channels. Sticky Shed Syndrome is the common name for binder hydrolysis which is common, especially in Ampex branded tape made from the 1970’s through the late 1980’s but it can be seen in other brands and types of audio and video tape too. Tape baking is one common approach to temporarily resolving this problem and if used carefully in an low temperature incubator, not a domestic oven, it is a safe and repeatable process for valuable tapes. Don’t worry, we won’t let this happen to your tapes! 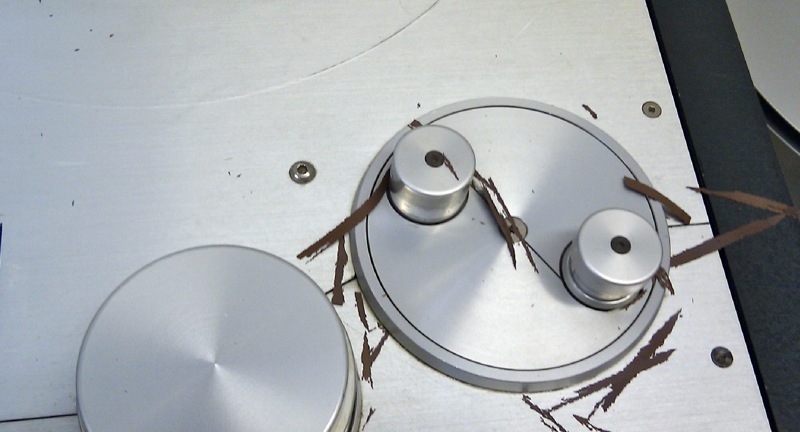 Certain brands and batches of magnetic tape can and often do have similar problems but rarely as extreme. With experience we know what to look out for and have the right tools to treat such tapes correctly so they can be restored, replayed and transferred. We have a Thermo Scientific Heraeus B20 laboratory incubator that can hold low temperatures very accurately over long periods while also having a safety upper temperature cutout to protect against over heating. Not something you want to do with magnetic tape! With tools such as this, our Studer A80’s, and our Sony APR 5003 tape machine we are able to gently handle and digitally migrate at high bitrates all track formats and speeds of quarter inch analogue audio tape. Some tapes which may not have ‘Sticky Shed Syndrome’ may have other binder problems and need manual cleaning too. This, if done appropriately, is a safe process and helps to reduce the loose binder clogging the heads and so creates a better sounding transfer. Being able to bake tapes at a stable temperature is one part of the process but careful winding of the tape is important. While some tapes are so degraded that they cannot risk being wound at all, many tapes exhibit ‘pack slip’ and need this addressed before it’s safe to bake. Many audio and video tape transports can be rough with tape, having several fixed guides the tape rubs over, harsh or incorrectly adjusted reel brakes that can stretch tape or very high tape tension that can risk delaminating older fragile tapes. We have a modified Studer A80 RC which handles tape very gently, having no fixed guides that the tape rubs against. It’s not just audio tape that can degrade! Video tape can exhibit the same issues in deterioration as audio tape and can be even more of a problem, due to the tape path and scanning video heads, in the transfer process. We are able to restore, clean and sometime bake video tape too if necessary.